I've been struggling with the mountain of research material that I already have and seems to be constantly published online and in magazines every other day. Last time I did a dissertation I just cranked the thing out in a solid week, but I want to try a more measured approach this time around. I've started reading each book, website and magazine, listening to each interview end-to-end and have found that extracting quotes as I go along and then putting them into a blogger with tags denoting the subject has actually been simplest. If you're struggling with the same problem, give it a go. After months of trying and having trouble with wordpress, I've managed to get a new site up. Not powered by wordpress, but by my own volition. Explore and enjoy. Also, this blog will be for things relevant to my work; inspiration and updates on processes. One day I found great kettle designed by Richard Sapper. The kettles’ beautiful sound plays the notes C and D and sounds like small locomotive. Inspired by this, I made a kettle of my own. 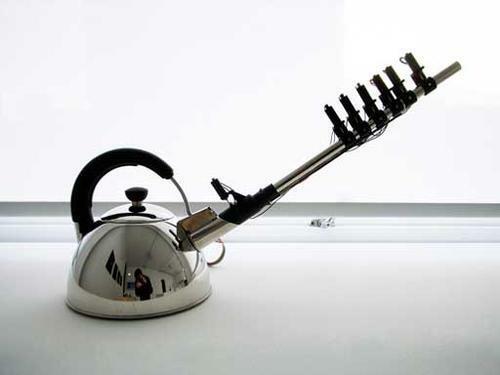 A musical kettle, which became part of the series’ re-design sound scape’. As the kettle boils it whistles your favorite tune… I want to contribute to the design of daily domestic noises: alarms, mobile phones, a doorbell; I have the opinion that not enough thought has been given to the noises they produce. 3.16 Billion Cycles is for sale as an edition of 5. Materials:Aluminum, AC sync motor, rubber belts. The combination of the imagery of buildings as trees that make up the forest of a city as well led to a desire to expand on the metaphor of the city as an ecosystem. In combination with the research on the environmental economies of slum cities this metaphor seemed to be a real possibility of holding grounds in reality. New Mumbai is a fictional slum city, born in the aftermath of a third gulf war and just about experiencing a boom in it's growth and economy by the time we join it in 2045. The project called for a cohesive narrative that could be believable and give credence to the science I was designing. It's readily apparent that some of the world slums are the most innovative places in the terms that we might describe a pragmatic, faux-utopian society. Resources are limited and high in demand and so nothing is wasted. The alleyway to his house is stacked full of processed debris and as the door opens, three generations of his family are separating plastics and leather on the ground floor. On the top rests a solar panel and biogas barrels. The water runs hot through my hands from the solar heater, proving that these aren't notional concepts, they work and make a difference to people's lives. A lot of these images happened to be from Mumbai anyway. The alien nature of the place, which looks imposing and closed, as if each building is it's own community adds to the feeling. If it was based on slums that were terraced houses in East London, the suspension of disbelief required to make the mental leap to giant mushrooms might not be possible.